California is expected to get $6.7 billion more in revenue than originally anticipated in the January budget, bringing the total budget for K-12 in 2015-16 to $83 billion from all sources, according to Gov. Jerry Brown’s revised budget proposal. Based on how Proposition 98 works, $6.1 billion of that extra state revenue is earmarked for K-12 schools and community colleges – a big win for education. Did you miss our live blog of the revised budget proposal? We have reaction from education organizations and officials, as well as details about how the budget will affect education. The ​L​ocal ​C​ontrol ​F​unding ​F​ormula will get an additional investment of $2.1 billion, raising the total amount of cash for ​the state’s school finance system to $6.1 billion. That means a $1,000 increase per student on average. Gov. Jerry Brown made career technical education a focus of his January budget proposal, offering $876 million for job training programs as part of a larger statewide effort focused on reinvesting in California’s workforce preparation efforts. 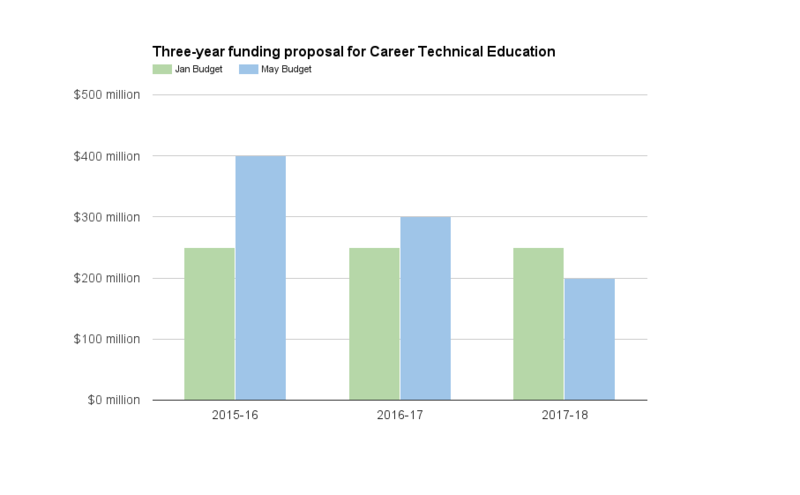 His May budget revision throws an additional $150 million toward career technical education, proposing a total of $400 million next year for his Career Technical Education Incentive Grant Program. First proposed in January, the program asks districts to provide matching funds to qualify for the grants, which would be awarded to programs that promote regional partnerships to meet emerging workforce needs. California has already budgeted $500 million over the past two years for a similar regional partnership grant program, the California Career Pathways Trust, but districts don’t need matching funds to qualify for that money. In January, Brown proposed $250 million over each of the next three years for his Incentive Grant Program. His May Revise tweaks that plan: Brown is now calling for $900 million over the next three years, making $400 million available in 2015-16, followed by $300 million in 2016-17, and $200 million in 2017-18. “This adjusted schedule will better allow schools to transition to entirely using their own discretionary funds by 2018-19,” Brown wrote in the revise. “It was a huge step in January for the governor to acknowledge the need to maintain the set-aside (funding) for career technical education, and the fact that he is now augmenting that first year by another $150 million is huge,” said Fred Jones, a spokesman for GetREAL, which advocates for career technical education in California. However, Jones said many programs were cut or closed when career technical education lost its dedicated funding stream with the passage of the Local Control Funding Formula, which gives districts more control over how they spend their money. Even the additional money won’t make up for past losses, Jones said. “This investment is in addition to the successful California Career Pathways Trust program, which has become a national model through funding innovative partnerships built among employers, schools and community colleges to train and prepare students for the modern economy,” Torlakson said in a statement. The governor has proposed an additional 2,500 part-time preschool slots aimed primarily at children with special needs. Early education advocates say 39,000 more preschool slots are needed to provide every low-income 4-year-old with preschool. Brown also proposes increasing funding to preschool programs by 1 percent to support parent outreach, staff training and screening of children for disabilities. “It’s fantastic that he is recognizing the importance of these activities,” said Erin Gabel, deputy director of First 5 California. But what Brown is proposing, Gabel said, “is a drop in the bucket in a robust Proposition 98 year for what we need to improve quality.” She said she sees the May revision as an invitation for a more in-depth discussion with lawmakers about what is necessary to improve quality at state-funded preschools. The Statewide Special Education Task Force, a group convened to propose improvements to special education in California, got a shout-out in the May revision — and some money for actions it recommended in its March final report. The May revision calls for $60 million in new funding ($50 million in ongoing funding and $10 million in one-time funding) to expand interventions for special needs children ages birth to 2, additional pre-school slots and an expansion of data-driven schoolwide behavioral supports. 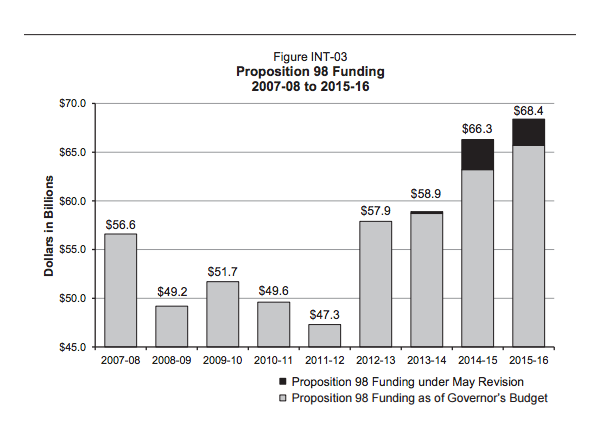 With additional Proposition 98 money to spend, the governor’s May revision includes an increase for California’s community colleges. The governor called for an additional $619 million over what he proposed in January for the 112-campus system, which would bring total community college funding to $1 billion more than 2014-15 levels. Among the highlights, the governor’s proposal includes $75 million to hire more full-time faculty and $60 million for programs that help improve remediation rates for new students. Children Now said California is taking federal funds for children’s health and sweeping them into the ​g​eneral ​f​und. When Congress overwhelmingly approved a 23 percent increase in funding for the Children’s Health Insurance Program (CHIP), it amounted to a $450 million windfall in California, according to Children Now. But those dollars have been swept into the general fund instead of targeted for children’s health, the group said. The governor’s May revision also seeks to quell tensions over tuition increases at the University of California, offering a compromise on a tug-of-war over student fees between Brown and UC President Janet Napolitano. UC base tuition will remain at $12,192 a year for the next two years under the deal. In addition, UC would receive a 4 percent increase to its base budget in each of the next four years and the state would provide $436 million over the next three years from the Proposition 2 “rainy day fund” to help UC pay down its pension obligations. The deal also includes $50 million for deferred maintenance and programs to promote energy efficiency. In return, UC will expand programs intended to help students graduate faster and transfer from community colleges. Notably, UC will streamline “transfer pathways” in its 20 most popular majors – modeling those efforts after the associate degrees for transfer program between community colleges and California State University campuses. For California State University, the governor proposed adding $38 million to the $120 million he called for in January, for a total increase of $158 million. The money would support enrollment growth for 4,000 students, plus enrollment of additional transfer students. CSU tuition would also remain flat next year. ​ CSU officials had asked for $269 million.​In a statement, Senate President pro Tempore Kevin de León accused the governor of “shortchanging” CSU, which is the largest four-year university system in the nation and is responsible for conferring more than half of all the bachelor’s degrees awarded in the state. Teacher credential fees will jump from $70 to $100 under the May revision – a consequence of the decreasing number of teachers seeking certification in California. Fees for credentials, examinations and accreditation keep the California Commission on Teacher Credentialing going, and those revenues have declined, according to the May revision, which includes an additional $4.5 million for the commission’s budget. The new fees would apply to an initial or a renewal teaching credential. The California Department of Finance says the fees are not out of line. “Even with this proposed increase, teacher credential fees would remain lower than renewal fees charged to professionals in a number of other occupational fields,” it said in a summary of the May revision. Pretty unexpected news! And $450 million it`s a huge sum at first sight, but when you remember that it`s a whole California, these figures seems to you normal. I agree that budget priorities should be in line with our kids. And let me add about teachers. In my opinion people who teach the next generation deserve sufficient fee for their job. Can you please address per pupil increases in K-12, as well subtracting (and more accurately quantifying) the required (approx) $600 per pupil and growing of debt passed to districts from the state, as well as expected tech and common core expenses. Thank you!